The Four-arm sinuous is a two-port dual-linearly polarised, multi-octave bandwidth antenna which is also physically compact. It is well suited to applications that require instantaneous polarisation diversity. The sinuous antenna provides good broadband characteristics but has the added advantage that it is capable of simultaneously receiving signals of different polarizations in the same aperture with good isolation between the ports. 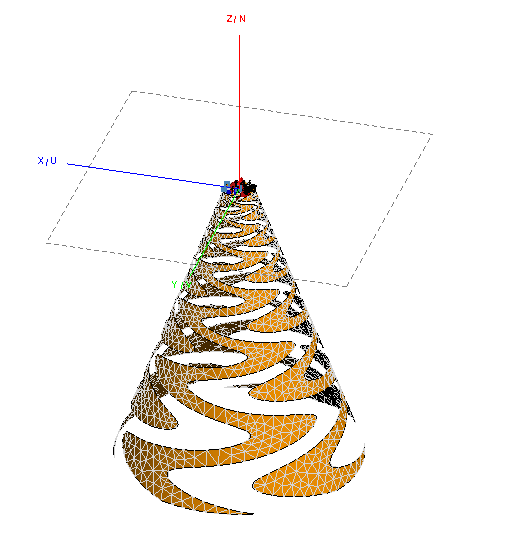 In this application note we look at the design process of the Conical Four-Arm Sinuous Antenna for a specified frequency range. 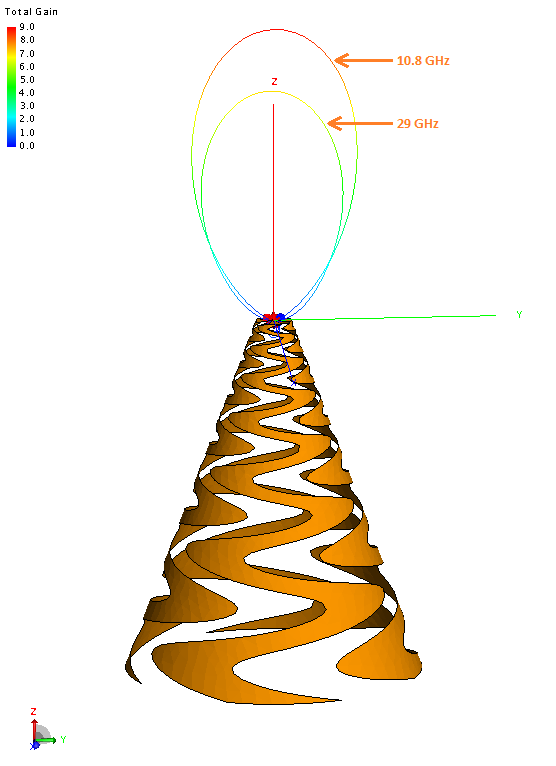 We also look at exporting the designed antenna to to CEM simulation packages to evaluate the frequency response of the antenna to its designed frequency range. If you have no previous experience in designing an antenna with Antenna Magus it is advised that you familiarise yourself with the user interface (UI) sections and its uses. Click here for more information. 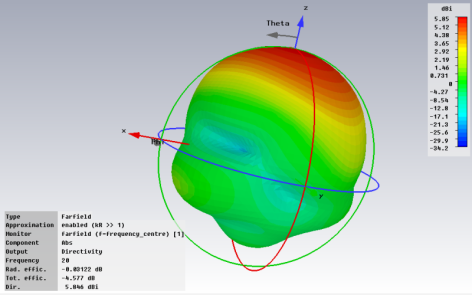 The conical corrugated horn application note also demonstrates basic navigation, workflows and key concepts in Antenna Magus thoroughly and is available here. To start the design process we have to locate the antenna that we will work with. Ensure that Antenna Magus is in 'Find' mode so that the Antenna Database is visible in the workspace and type "Conical" and "Sinuous" into the search bar. When searching the Antenna Database the antennas are grouped according to the keywords, with the most relevant antennas at the top. 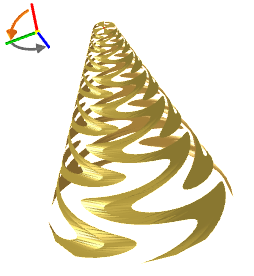 When searching "Conical" and "Sinuous" the top group contains a single antenna. 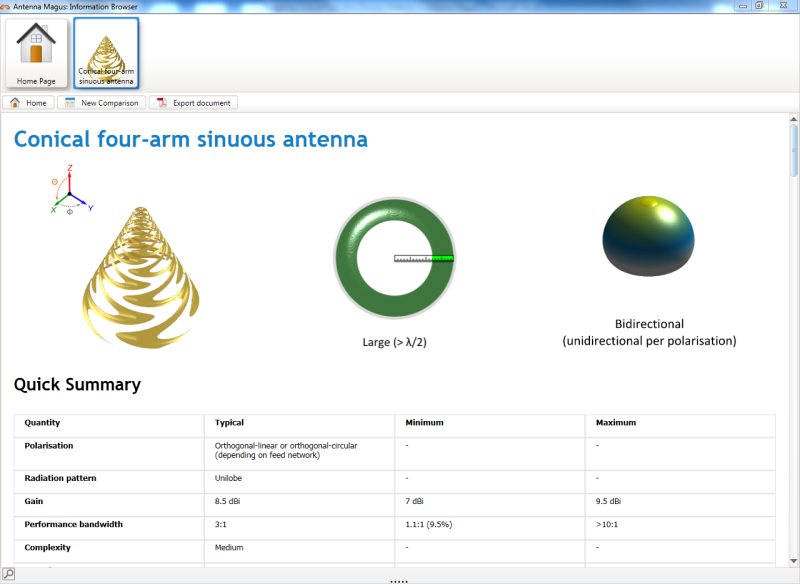 Add this antenna (conical four-arm sinuous antenna) to the user collection by double-clicking or clicking the 'Add' button visible while hovering over the template's icons. Also add this antenna to the info browser by clicking the 'Info' button also visible while hovering over the template's icon. In the info browser additional information on the antenna can be viewed and compared with other antennas. After inspecting the information, close the information browser and navigate back to the main Antenna Magus window. 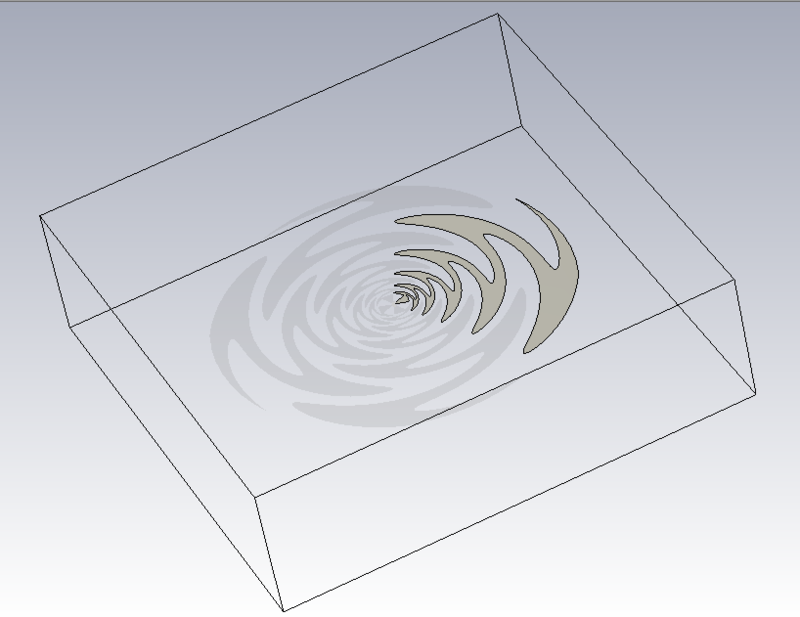 The Conical Four-Arm Sinuous Antenna template has a single design method that allows for the design of the antenna by specifying the desired frequency range. 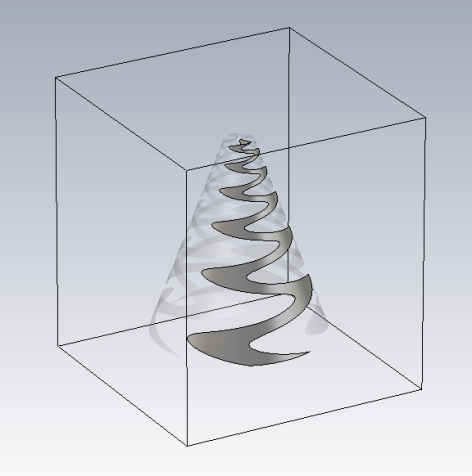 Click on the Conical Four-Arm Sinuous Antenna prototype in the 'Collection'; Antenna Magus open 'Design mode' and start a new design. A new design can also be started by clicking the on the 'New Design' button in the 'Home' ribbon when a prototype is already open. In 'Design Objectives' expander in the palette set the minimum frequency (fmin) to 10 GHz; the maximum frequency (fmax) to 30 GHz and the polarization to 'LHC'. 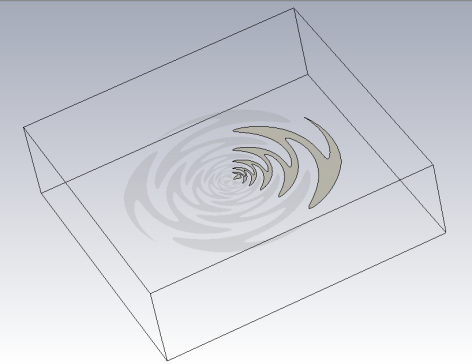 Click on the 'Design' button to design the antenna for the specified frequency range. Inspect the designed parameters in the 'Parameters' expander in the pallet and note how they correlate with the sketches in the workspace. Once finished inspecting the parameters, click on the 'Estimate performance' button at the bottom of the 'Parameters' expander to run the simulation. Navigate to the 'Estimated Performance' tab once the simulation has completed to inspect the results. Several results can now be viewed in the workspace. The plots below show the radiation pattern for the design at different frequencies. Note that regardless of the frequency the radiation pattern remains relatively similar. A key feature of Antenna Magus is that exported models are completely parametric and ready-to-run. Exported models can have their parameters altered in external packages and simulated with ease. Follow the links bellow to view the section on exporting to CST Studio Suite and FEKO respectively. Ensure that the Conical Four-Arm Sinuous antenna prototype is open. Select the design and click the 'Export Mode' button in the 'Home' ribbon. This will open 'Export mode'. Ensure that the 'FEKO' tab is selected. Inspect the parameters to be exported and click on 'Export Model' in the 'Export' ribbon. Save the model to a convenient location. Minimize Antenna Magus and open the exported file. The Antenna Magus prototype is now open for editing in CADFEKO. Before we start to simulate the model in FEKO a surface mesh of the model has to be created. This mesh is required to run the solver. In CADFEKO Navigate to the 'Mesh' tab and click on 'Create Mesh' to open the 'Create mesh' dialog. Inspect the parameters in the dialog an click on 'Mesh' to create the mesh for the model. The model along with its mesh is shown below. Once the mesh has been created we can open POSTFEKO to start the solver. In CADFEKO navigate to the 'Solve/Run' tab and click on the 'POSTFEKO' button. POSTFEKO will load with the solver ready to run. In the 'Home' ribbon click on the 'FEKO solver' button to run the simulation. The simulation will require significant time to run. To the left are some of the results to the FEKO simulation. The farfields were simulated over the operating frequency range that the antenna was designed for (10 GHz to 30GHz). The two farfields shown are close to the boundaries of the operating range. 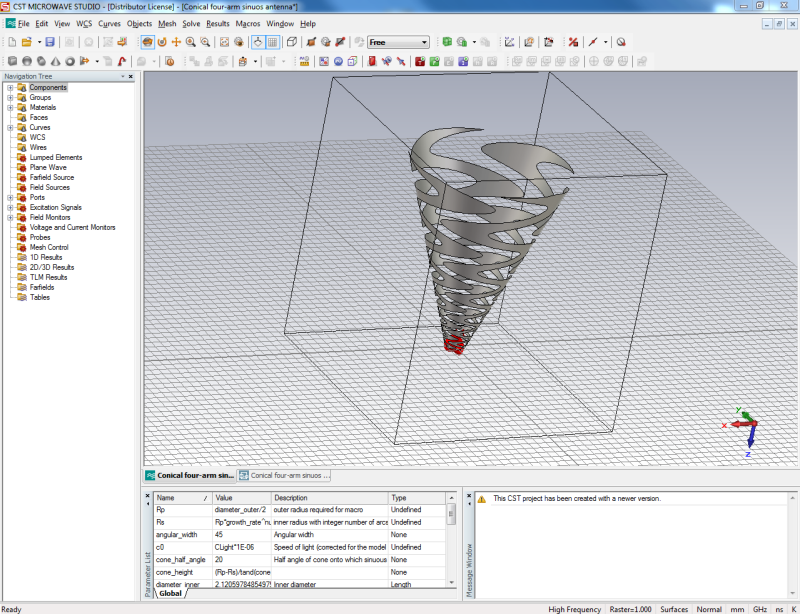 Creating a model of the Conical Four-Arm Sinuous Antenna is a complex task. For the CST MSW model engineers at Antenna Magus used an innovative method for construction. The model for the Planar 4-arm sinuous antenna (shown below) was used as a starting point. 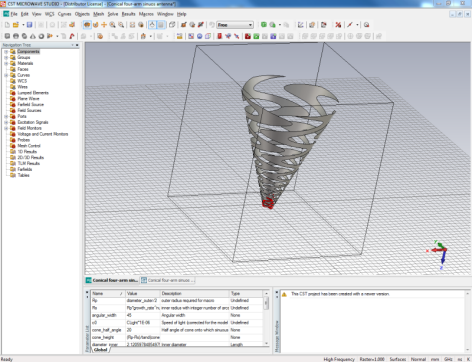 An arm from the model was extruded to form a 3D sinuous arm. From this 3D arm a cone section was taken to yield a sinuous arm moving down in a conical shape. The image below illustrates the intersecting extruded arm and the cone. The result of the intersection yields one of the arms as shown in the image below. Since the arms in a Conical 4-arm sinuous antenna are identical, three copies of the arm were made and rotated into place to form the complete antenna. 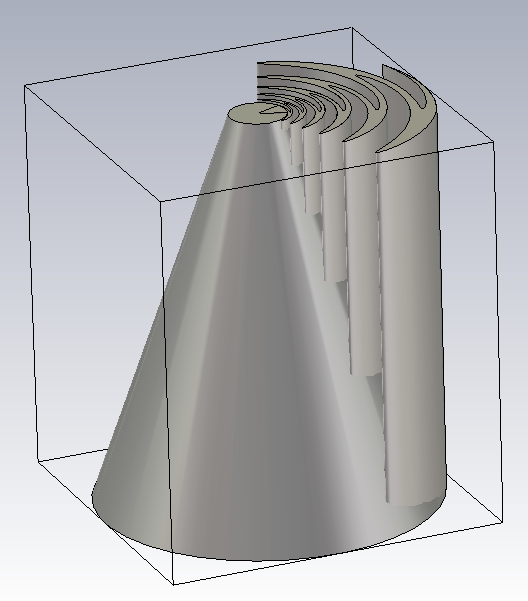 To start exporting the model from Antenna Magus ensure that the Conical Four-Arm Sinuous Antenna prototype is open. Select the design and click the 'Export Mode' button in the 'Home' ribbon. This will open 'Export mode'. Select the 'CST MSW' tab. Inspect the parameters to be exported and click on 'Export Model' in the 'Export' ribbon. Save the model to a convenient location. Minimize Antenna Magus and open the exported file. The Antenna Magus prototype is now open for editing and simulation in CST MSW as shown below. To run the solver in CST Studio Suite, click on the 'Solve' drop-down menu and select 'Time Domain Solver'. This opens the 'Time Domain Solver' dialog. Inspect the settings on the dialog and click 'Start'. The simulation will require significant time to run. Once the simulation has completed the results can be viewed by using the 'navigation tree' located on the left of the window. Expand the 'Farfields' node to and select the farfields at different frequencies. Below is the farfield at centre frequency. This application note discussed the process of designing a Conical four-arm- Sinuous antenna using Antenna Magus. The Conical four-arm- Sinuous antenna template has one design method available and it was used to design an antenna for a specific frequency range. Next we discussed how to export the antenna model to FEKO and CST MSW also how to run these models. Antenna Magus exports ready-to-run models and the ease of running these models in external packages was illustrated.